“It’s a pity this war time drama’s being shown at such a late hour, since it’s adapted from a well-known children’s novel and would make perfect teatime viewing. John Thaw takes the lead as the curmudgeonly rural widower Tom Oakley, who’s got Victor Meldrew’s personality and the beard of Uncle Albert from Only Fools and Horses. Although the character is obviously different from Morse and Kavanagh, ‘the beard adds another dimension’ John says. Old Tom is none too pleased to be landed with a young boy evacuated form Blitz-torn London during the War, but there are nice surprises ahead in this shamelessly heart-warming drama. Maybe it’s because he plays his characters with a certain endearing grumpiness that you somehow imagine John Thaw is going to be equally bad-tempered. He’s not. There’s a relaxed warmth and gentleness that is quite a surprise from the actor renowned for playing tough cookies like Jack Regan of The Sweeney and Inspector Morse. ‘I do have my grumpy moments if things aren’t going very well. But I’m no more grumpy than anyone else’ he says, pouring himself a coffee as he eases back into a sofa. There’s nothing forceful or showbizzy about him. He is quietly confident and, if anything, slightly shy. More like a kindly uncle in manner than one of TV’s millionaire actors, his snow-white hair framing his face and his soft blue eyes. If meeting him isn’t surprise enough, his latest ITV role certainly is. 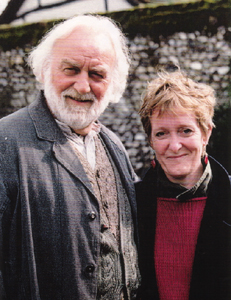 Complete with whiskers and a beard, looking not unlike Father Christmas, he stars in Goodnight Mister Tom.